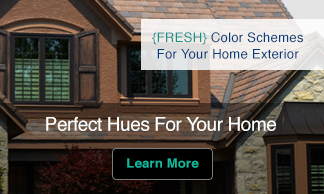 Recently a homeowner contacted us with a question about selecting a roof color for the new home he is having build. He is in the process of selecting materials and knew he wanted to include the copper patina tiles shown below. Our homeowner also knew he wanted lightweight roof tiles but he thought his choice would be limited to the green or gray imitation shake or synthetic slate roofing. Since the copper is being installed with the patina already applied the roof will not change color further so he certainly could select a green or gray tile to harmonizes with the copper but these are not his only choices and for a homeowner who is going to install copper and let it age naturally they might not be the best color choice. Here is why. Copper oxidizes when it is exposed to the elements. 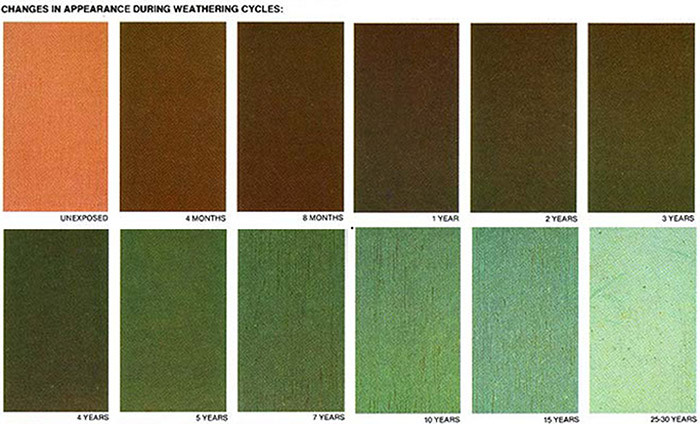 Rather than rust it morphs from a shiny yellow-orange to deep brown then green and finally becomes dull bluish-green. As the process occurs the copper is developing what is known as patina. Copper patina is called verdigris. The term comes from the French phrase “verte grez” meaning green grey. The chart below (I took the liberty to reformat it) comes from Denninger a company that produces copper weather vanes and finials. It shows how the color naturally advances from raw copper to chocolatey-brown to dark verdis to the almost white of a truly aged copper decoration. Denninger gives this as a guide but also notes that in some geographic locations, copper will patina faster, or with a different hue. The homeowner could use any of the warm shake or slate tiles that have cooper-y undertones. I have shown a few that might work well above. Any of these will blend with copper. You can see how well the tiles below work with the cooper above at each stage of the patina process. The warm undertones of these Bellaforte tiles are an excellent choice for homes with copper details whether the copper took 20+ years to reach the patina or was installed new with a “pre-aged” finish. This is because the based color of the copper continues to influence the surface color. The same line of thinking can apply to any metal that has a finish or patina. The color change is most pronounced with copper but consider the original color as an option when creating a scheme for any metal details on your home inside or out. Appreciating the time and effort you put into your site and detailed information you present. It’s nice to come across a blog every once in a while that isn’t the same out of date rehashed information. Great read! I’ve bookmarked your site and I’m including your RSS feeds to my Google account. Thank you so much for this bit of info just what I needed for a current project. Can you seal copper when you get a tone you like to keep it that tone going forward? 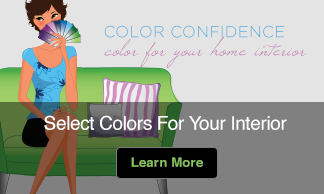 Thanks, that’s very helpful as I try to pick a trim color that will complement our copper roof over a bay window.